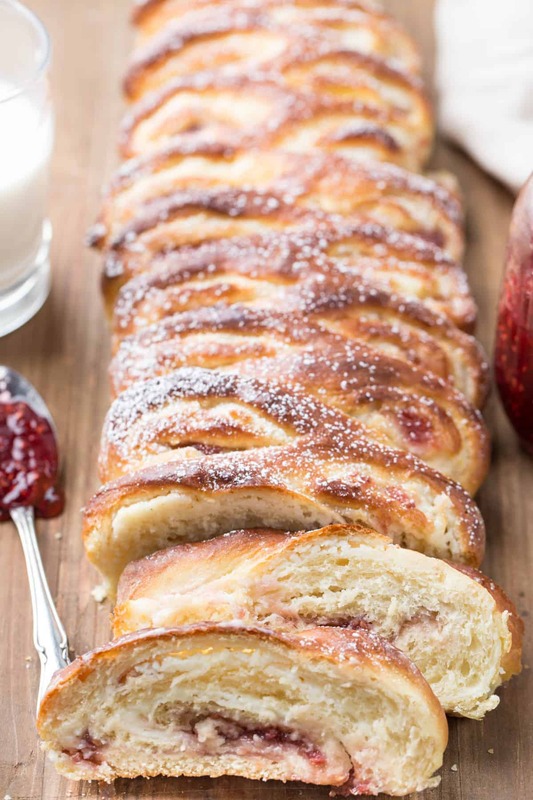 Twisted Sweet Bread Recipe- Fluffy and soft sweet twisted bread filled with raspberry jam and cream cheese. The combination of soft dough with jam and cream cheese is heavenly. 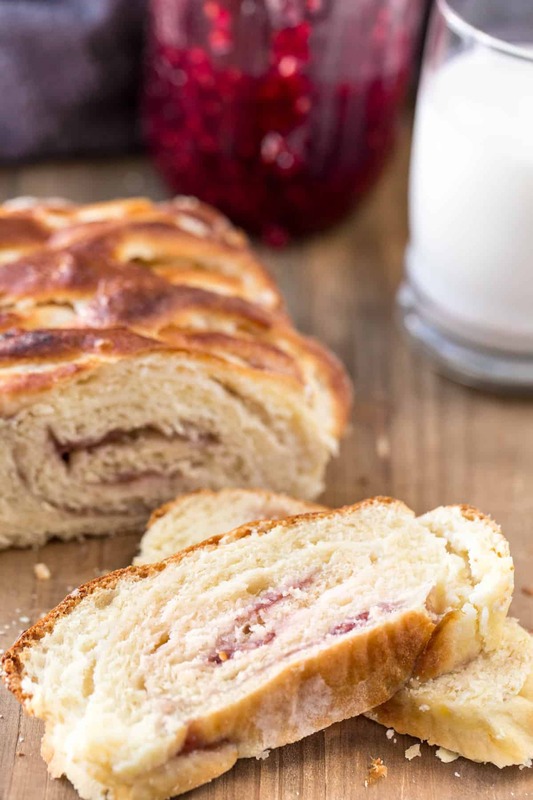 If you like this sweet bread recipe, try our Poppy Seed Roulade or our Cherry Cheesecake Buns. 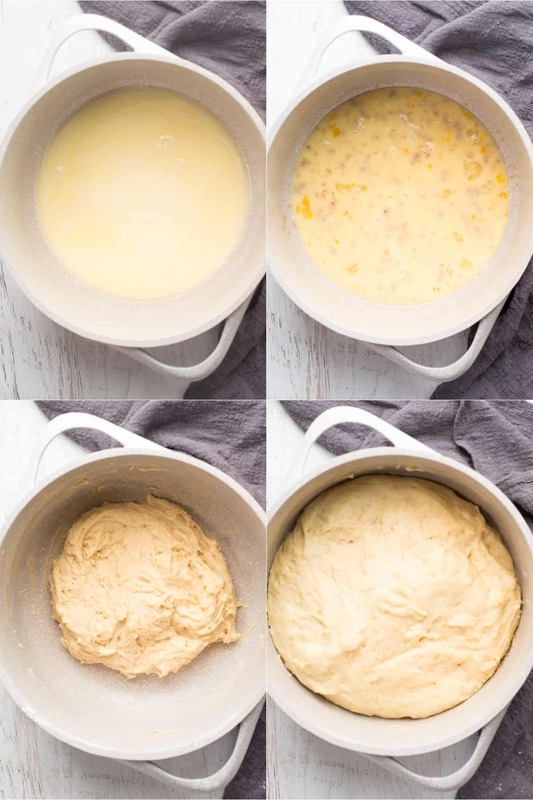 This homemade dough is going to become your favorite dough for sweet bread, buns or rolls. The dough is so easy and quick to prepare and it comes out perfect every time. The jam and cream cheese filling add so much flavor to the bread. Enjoy the twisted bread while it’s still warm with a cup of cold milk. In a saucepan, combine the sugar, milk oil and butter, heat until warm. TIP: If the milk mixture gets too hot, allow it to cool down before adding the eggs and yeast. Whisk in eggs and yeast. Allow to sit until yeast activates, about 3-5 minutes. Add sifted flour and mix until well combined. The dough will feel soft, pliable and slightly sticky. TIP: All flour is different, add a few tablespoons of flour at a time if the dough is really sticky. Cover and set aside to rise until doubled in size. Generously cover the working surface with flour. Add the dough. Add more flour to the top of dough. TIP: Dough will be really soft, for best results, keep working area coated with flour so the dough doesn’t stick to the countertop or rolling pin. Add cream cheese and jam. TIP: You can add more jam than the indicated amount. Roll the dough tightly in a log. 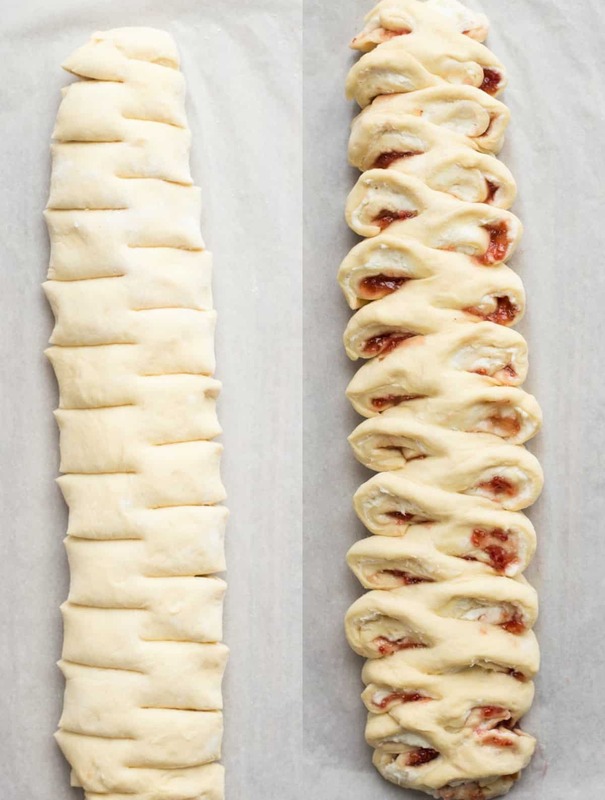 With kitchen shears, cut the dough on either side of the log and twist dough. 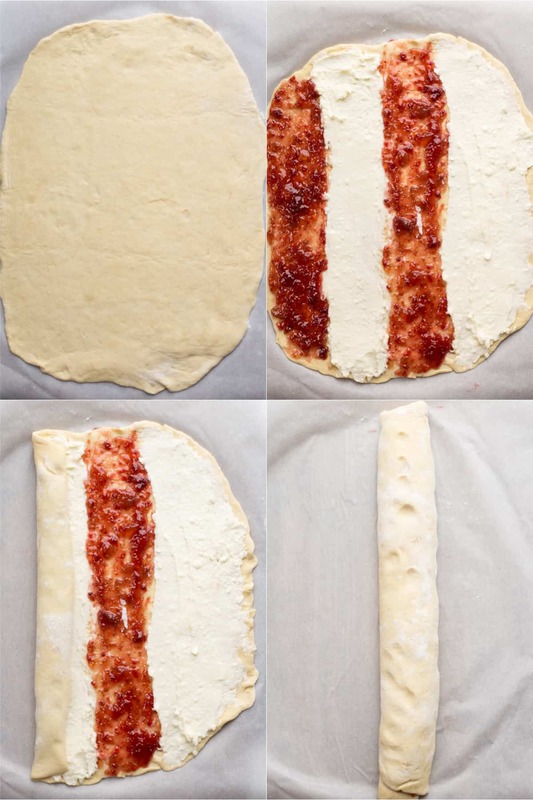 TIP: When cutting, cut between dough on the opposite side (see picture). Let bread rise, brush top with egg wash. NOTE: Kitchen shears are amazing and make cooking so much easier. If you don’t have a pair, I’d highly recommend you get a pair. THESE shears are the ones we have but you can purchase a less expensive pair. what kind of jam can I use? 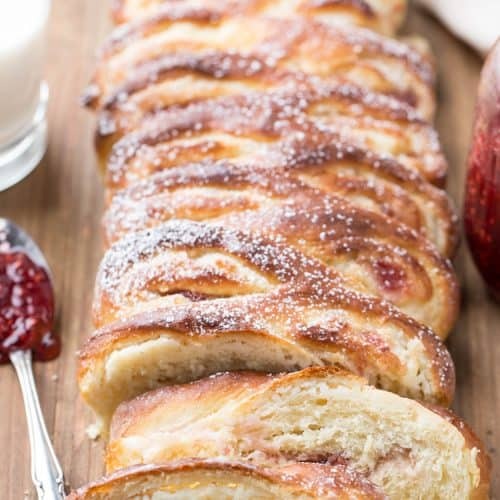 We used raspberry jam but you can use your favorite jam in this recipe. Apricot is another favorite of ours. However, strawberry, blackberry, blueberry or peach also are great with the cream cheese. how to store braided bread? Keep bread covered and at room temperature up to 2 days. TIP: Reheat in the microwave or toaster oven before serving if warm bread is desired. In a saucepan, heat the sugar, milk, butter and oil. Once warm, remove from heat and whisk in beaten eggs. Add yeast and lightly mix. Cover bowl and allow to sit for 3-5 minutes until yeast activates. Add in sifted flour and mix until flour is well incorporated. Cover and set aside to rise at room temperature for 1 hour. In a bowl, beat cream cheese and sugar. Dust working surface with flour. Transfer dough onto surface. Add more flour to the top of dough. Gently roll out the dough into a rectangle about 16x12” in size, adding more flour as needed so the dough doesn't stick to the rolling pin. Generously add the jam and cream cheese in rows, see picture. Gently roll up the dough to form log and place seam underneath. Pinch edges of log and tuck under so the filling doesn't ooze out. Transfer bread onto a baking sheet lined with parchment paper. With kitchen shears, cut bread on either side, see the picture. Allow bread to rise 30 minutes. Whisk together egg and water, brush tops of bread. Preheat oven to 375°F. Bake for 16-18 minutes, until the top of bread is golden. If you don’t have a large baking sheet, shape dough into two smaller portions. Note: All flour is different. Add a few additional tablespoons of flour at a time if needed to achieve the described dough consistency. Thank you for another amazing recipe!! I did also have some trouble with making it look as good as yours, but the outcome didnt affect the taste 🙂 I also doubled the recipe right off because I just knew my family would love this!! Next time, Oksy. Practice makes perfect. 🙂 Next time I make this sweet bread, I’ll record a video to share. Thanks for visiting our online home. I’m so glad I took the time to make this! It was delicious! I have now made this sweet bread twice. I double the recipe which makes 2 rolls and then I have some for the freezer! Love the cream cheese filling. Thanks? Made this yesterday…your pictures looked so good, I doubled the recipe ? Truth is; this sweet bread tastes even better than it looks. I had trouble ‘twisting’ the rolls so they don’t look as pretty as yours but they are so DELICIOUS! I especially love the cream cheese in the filling. Thanks for another great recipe Valentina. Maybe you can do a video for this one showing how you do the twisting. Thanks for the awesome feedback on the sweet bread. I am with you on the cream cheese, such a wonderful surprise! Thanks for the suggestion of a video, note taken. 🙂 And thank you for being apart of our online home. This bread looks so delicious! My family will love it!! We are huge fans for homemade breads. We barely ever buy bread because I think nothing ever lives up to homemade. I love all the useful tips you have made for the twisted bread dough. My favorite part about twisted bread is the layers it creates, its more flaky. Great recipe! Thanks, Natalya! 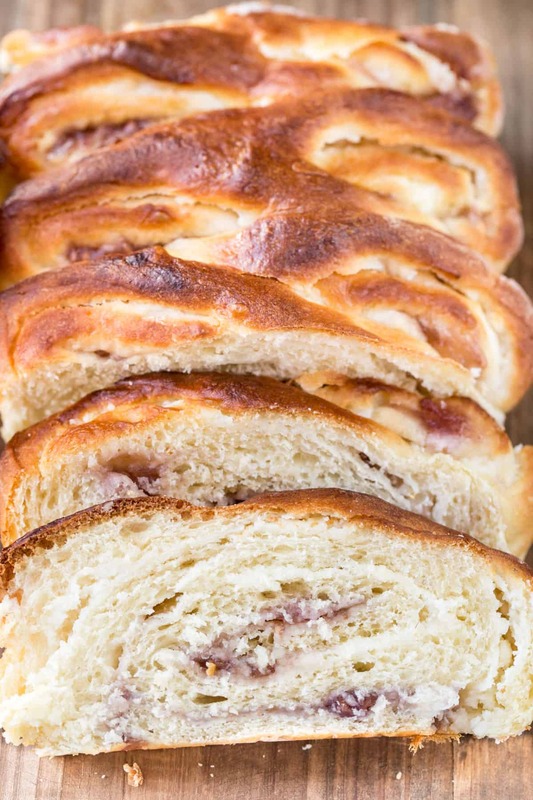 We love this sweet bread. I especially have a weakness for cream cheese so this recipe makes me very happy, haha!